Start with vodka, mix in some tomato juice, add a little Tabasco sauce, garnish it to your liking, and you've got yourself a Bloody Mary. Except it's not that simple. Bloody Marys are robust and dynamic cocktails. You can have them on a Sunday morning over brunch or a Friday night over dinner. You can add bacon to them or you can keep it simple with celery. For an amazing rendition on this classic cocktail, check out these 10 places in New York. The Large & In Charge Bloody Marge is actually like eating an entire meal. It is served with mozzarella sticks, a slider, shrimp, wings, grilled cheese and veggies. Order this and you'll be stuffed! This is a southern-inspired restaurant located in the Carroll Gardens section of the borough. The owners provide three versions of a Bloody Mary along with the classic. The Star of the Sea cocktail comes with celery and peppercorn-infused vodka. It is served with an oyster. Another version is made with whiskey topped with stout. A Bloody Mary menu is offered every Sunday. Options include the Aroma Mary, the Buffalo Bloody and the Hail Caesar. The Ragin’ Cajun blends clamato, fire roasted pepper and old bay seasoning topped with shrimp, olives, celery and lemon. A Slim Jim tops it off. This restaurant’s Bloody Board is available on Sundays until Memorial Day, when brunch service is suspended for the summer season. Pick and choose to make a unique Bloody Mary. Choice of vodka, a carafe of mix and glasses filled with garnishes such as pickled fiddlehead ferns, and cherry bomb peppers. This place is hidden in a small town near the Windham Mountain and Hunter Mountain ski areas. It offers an unbelievably delicious Bloody Mary with raw shrimp to top it off. On Mirror Lake, this is the place to build a unique and delicious Bloody Mary. Vodka options include things like Ketel One, Belvedere, Tito's, and Grey Goose. Then pick from a selection of garnishes such as traditional celery, pickle, Spanish olives, spicy olives, and spicy pickles. 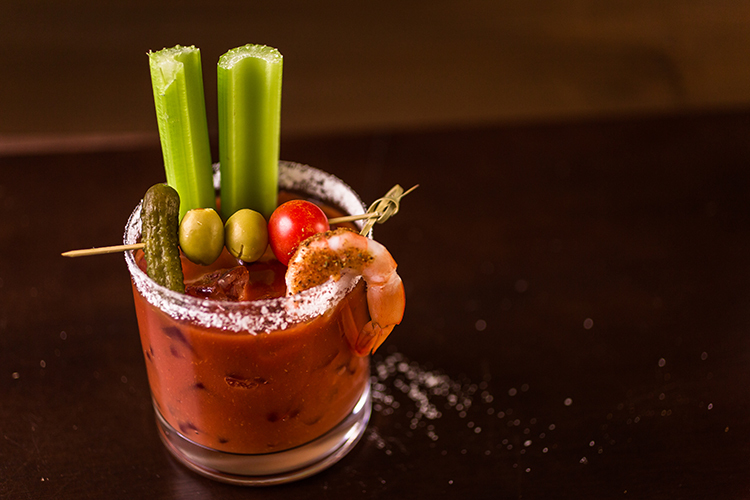 The Sunday brunch menu includes a Bloody Mary Shrimp Cocktail. It is served with three shrimp soaking in the drink along with stuffed green olives. The Bloody Carrie consists of grilled carrot juice, tomato, smoked habanero hot sauce, tequila and mezcal. It is served with a guajillo chili salt rim and pickles, carrots and tomatoes. The Jealous Mary is made with green tomato, kale juice, green Tabasco, vodka, and garnished with pickled green tomatoes. Phoenicia is a wonderful town in the Catskill Mountains. The diner is known for its breakfast dishes and the morning meal can be spiced up with its version of the Bloody Mary. Peace Vodka is distilled with pure Catskills mountain water, and that water is refreshing year-round. Grabbing a beer is the natural instinct at a brewery but consider this restaurant’s version of the Bloody Mary. The featured star on one of its cocktails is red snapper. View more New York Bars and Saloons.